Our business is to Save You Money! Parts Un-Ltd., founded in 1987, is one of the world's largest independent wholesale distributors of Allison, Detroit Diesel, Terex and Euclid parts and components. Our 172,000 square foot custom warehouse gives us the ability to keep the largest supply of parts and components in stock and in most cases we can ship the same day you order. 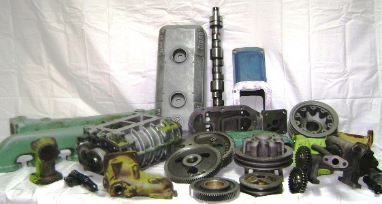 Our goal is to have the widest selection of parts available in stock, at the most competitive prices. Whether the parts you need are New Surplus, New Replacement, Remanufactured, or Used, Parts Un-Ltd. either has it in stock or is in the best position to help you locate it. For over 30 years, Parts Un-Ltd.'s customers have come to expect fast, reliable service when looking for the parts they need. The majority of our employees have been with us for 10+ years and are experienced and dedicated to serving you. Enjoy the convenience of Parts Un-Ltd. as your ONE STOP SOURCE!